Let's open the Farm Report this week by checking in with some players who are rehabbing their way back to the Majors or a higher level of the Minors. This group turned out to be a bit bigger than I expected so let's get to it. 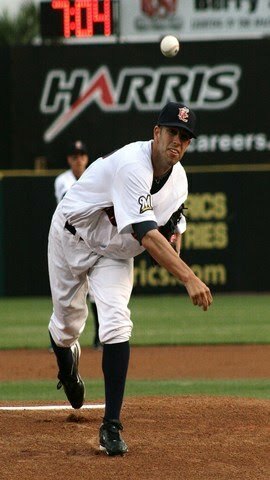 Chris Capuano - SP - AAA - Capuano gets all the publicity and deservedly so. His future with the Brewers will be determined very soon and we'll have more on that later this week. But in the mean time, Capuano has made three very good starts for Triple-A Nashville, striking out 13 while walking only three and putting up a sparkling ERA of 2.14. David Riske - RP - AAA - Also pitching for the Sounds is the forgotten man, David Riske. Riske was alright with Brevard County and has been good in two appearances for Nashville. His minor league numbers this year are mediocre, a 6.00 ERA and seven hits allowed in six innings. All of those hits and runs came in A-ball though. 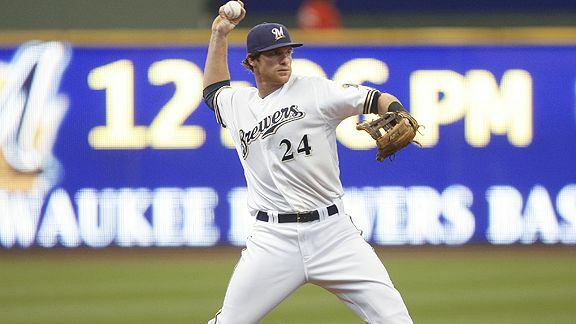 Mat Gamel - 3B - High A - Finally, the Brewers top third base prospect has found his way onto the field. His start with Brevard County has been slow, but to a certain extent that is to be expected. In his first five games he's gone 2-for-17 with four walks and six strikeouts. Josh Butler - SP - High A - Butler is easing his way back into the swing of things in 2010. He's made a pair of appearances for the Manatees, one good and one bad. In his first outing he went two scoreless innings. In his second, he went two innings and gave up seven runs on nine hits. We'll keep an eye on him as he works his way towards either Double-A or Triple-A. 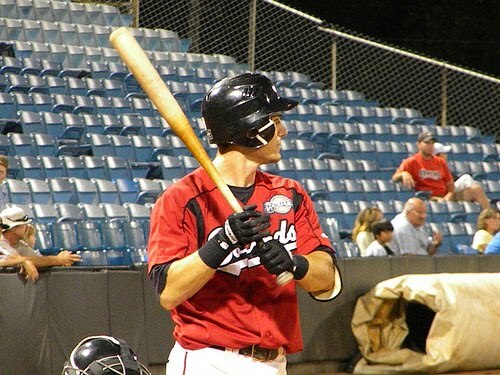 Ryan Gennett - 2B/SS - 'Breakout Season' may not begin to describe what Gennett has done this year with the T-Rats. Gennett will be flying up the prospect rankings this summer if he can maintain his early production. In 42 games he's batting .348 (4th in the Midwest league), he has 79 total bases (6th in the league) and has 15 doubles (tied for the league lead). Not bad for a middle infielder. Chris Dennis - OF/1B - Dennis has picked up his production since we last checked in, in his last ten games he's batting .316 with nine runs driven in and a .422 OBP. For the year he is tied for second on the team with 25 RBI's. Khristopher Davis - OF - A new addition to the farm report, it's hard to leave a player off that has been as consistent as Davis. In 2010 he is batting .322 with 75 total bases and a .411 OBP. Solid numbers all-around but what you would hope to see from a college hitter. 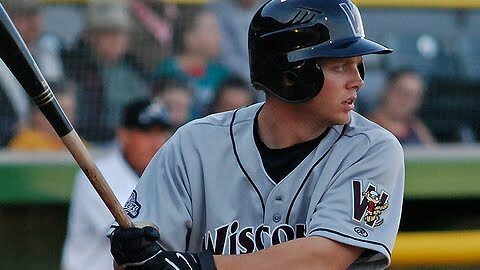 Cutter Dykstra - IF - Back on the list is Cutter Dykstra, whether or not he stays in the Farm Report is up to him, but he's been solid in his second stint with the Timber Rattlers. Dykstra has played in 17 games and scored 12 runs while batting .288 with a .391 OBP. He's back in the mix. Nicolas Bucci - SP - If the list gets longer it means prospects are playing well, so let's welcome Bucci to the Farm Report. He leads all Rattlers pitchers with three wins and has the best ERA of any starter, at 1.82. Also impressive is the 1.18 WHIP, best of any starting pitcher. Eric Arnett - SP - More of the same from Arnett, he's been below average at his best and awful at worst. In his last two starts he has given up two and seven earned runs. Hard to say what is wrong with him precisely, his command is improving but he's still walked three or more in four of his last five appearances. Jake Odorizzi - SP - His last time out Odorizzi was roughed up, giving up four runs in five innings pitched, but his command hasn't left him. In his last two starts he's struck out 12 while walking four. The Highland, Ill. Native has also struck out 45 batters in 33.2 innings, not too shabby. Kyle Heckathorn - SP - Let's forget about Arnett for a minute and focus on the other hard throwing pitcher the Brewers drafted high last year. Heckathorn has had two very promising outings in his last two appearances, he's pitched 13 innings and given up only one run. Best of the Rest: Andrew Lamontagne (RP) has a 1.82 ERA in 24.2 innings pitched. 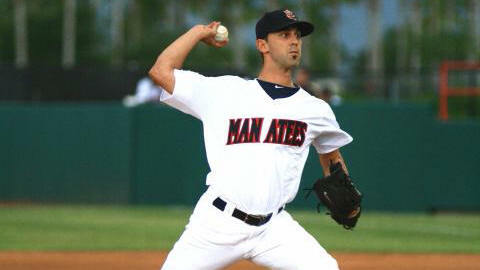 Erik Komatsu - OF - Still rolling, Komatsu has been a model of consistency for the Manatees in 2010. In his last ten games he's hit .310 with six driven in. For the year he's batting .326 with more walks (15) than strikeouts (14). Josh Prince - SS - With more playing time, Prince's numbers have continued to improve. In his last ten games he's batting .318, for the month of May he's hit a very fine .309. One area he needs to improve is his walk rate, in his last ten he has no walks and for the month he only has three. Unacceptable from a leadoff hitter. Kentrail Davis - OF - Davis finds himself mired in a pretty deep slump, in his last ten outings he's batting .132. While he's struggled to hit the ball he hasn't struggled with his plate presence, in that same stretch he's walked eight times to give him a .313 OBP. Michael Fiers - SP - Good and bad for Fiers since we last checked in. His last time out he gave up three runs and only lasted 3.2 innings. His previous outing was spectacular however, when he struck out 11 in six innings while walking none. A 1.03 WHIP from a starter is impressive, but I doubt we'll get a sure read on Fiers until he gets promoted to Double-A. Wily Peralta - SP - Peralta was roughed up his last time out, giving up eight runs in four innings to see his ERA rise to 4.44. Peralta also gave up his first home run of the year in that loss as well. His command has been solid though, with only 15 walks in 46.2 innings. Maybe too many strikes though, he's given up 50 hits in those 46.2 innings. Cody Scarpetta - SP - More of the same from Scarpetta, inconsistent with his command and generally not sharp. His ERA has climbed to 4.91 and he walked four in his last outing. Scarpetta will need to show more consistency in the strike zone if he wants to have a better summer than spring. Best of the Rest: Daniel Meadows (RP) has an ERA of 2.53 in 32 innings... Shawn Zarraga (C) is hitting .326 through 24 games... Sergio Miranda (DH) leads the team with 31 RBI's. Lorenzo Cain - CF - It's just a matter of time before Cain is promoted to Triple-A or even the Majors this season, he's been good enough and deserving. Back and healthy, Lo Cain has hit .265 in his last ten with ten walks and his second home run of the year. 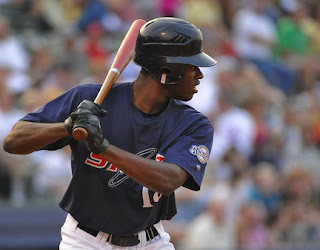 Cain has been a perfect leadoff hitter for the Stars, batting .343 on the year with a .444 OBP. Caleb Gindl - RF - A poor month of May has continued for Gindl, who is only hitting .222 this month. He did hit his third home run of the season since our last report and his season average is an acceptable .270. Still, you'd like to see more consistency from a player considered to have MLB potential. Brett Lawrie - 2B - It's been a much better showing from Lawrie since our last report. Batting .361 in his last ten, the Canadian slugger is downright hot. In that time period he has nine runs batted in and five extra base hits (two triples, two home runs and a double). More importantly he struck out only four times and walked six. Zelous Wheeler - 3B - Wheeler gets the nod here in place of fellow third base prospect Taylor Green for two reasons. First, Green is injured and has landed on the disabled list and second, Wheeler is having a better season in many ways. For the year he sits at .270 with a .388 OBP, most impressive may be that he has more walks (23) than strikeouts (16). Amaury Rivas - SP - Last season's minor league pitcher of the year continues to be the ace of the Huntsville staff. His last two starts have been quality, including one very good outing. In Rivas' last start he pitched six innings giving up three runs. The appearance before however he pitched eight innings of one run ball, striking out five. Rivas is already on the 40-man roster so it would not be a surprise to see him with the big club sometime this year. Mark Rogers - SP - There are some signs that Rogers might be getting into a grove of late. He's gone five innings in each of his last three starts (that's good for him), two of which were scoreless outings. His last start might be most promising though, he struck out six while walking just one and gave up no runs. Interesting split, of his 25 walks 19 have come against left-handed batters. Best of the Rest: Brent Brewer (SS) is batting .275... Brandon Kintzler (RP) has eight saves and still hasn't given up a run in 18.1 innings. Adam Heether - 3B/UTIL - After a slow start, Heether has come out of his slump. In his last ten games he's batted .306 with nine driven in. On a team wracked with injuries and lacking offensive firepower it's good to see him swing the bat. If he can hit with little protection this season he should be primed to win a spot on the big league roster either later this season or next spring. Tim Dillard - RP - The month of May has not been kind to Dillard, after putting up an ERA of 1.93 in April, his May ERA sits at 8.68. His new delivery is a work in progress and what you have to like is his much improved command, even if he is currently throwing too many pitches in the zone. In 23.1 innings he's only issued two walks. Mike Jones - RP - The move to the bullpen has been a good one for Jones and it now sees him pitching at Triple-A. I have a suspicion Jones' isn't done with his chances as a starting pitcher but a bullpen role might see him in the Majors sooner than later. In three innings pitched he has yet to give up a run with the Sounds. Best of the Rest: Mike McClendon (RP) has an ERA of 0.37 in 24.1 innings split between Huntsville and Nashville... Trent Oeltjen (OF) is batting .281 with 14 doubles. Female Escorts: Rations were gathered and divided to last for two weeks. The men wore sunglasses at all times to prevent snow blindness, and avoided eating too much snow as it would result in sore throats.